Ok, so everything I post is usually about the Penguins (and it will continue to be) but I figured that maybe there are a few people that may read this blog that are Pirates/Steelers fans but maybe not Pens fans. So, to accommodate them (and mainly just because I like talking hockey and the Pens are off) I figure that every now and then I will talk about some of the non-Pens stories going around the NHL. Ok so this is a scary one. 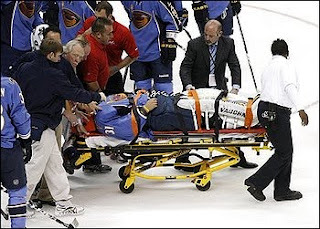 I'm sure you've all heard it by now but one of the top stories that surrounded opening weekend last week was the sudden collapse of Thrashers goalie Ondrej Pavelec. The strangest part of it was that there was no warning of the incident in advance and the next thing you know...he's unconscious. Doctors are saying now that its a fainting spell and that he should be playing again soon. Yea I spared you from a picture on this one. Yep, they are not too happy right now down in Minnesota and Columbus. It seems to be working though, as the Wild look much better against the Nucks. NHL means business on enforcing that instigator in last 5 min rule as they have already dished out a 1 game suspension to Leblond of the Devils as well as a fine. I'm not sure I agree with the suspension, but I do agree with the penalty/fine. Yep this was a pretty flagrant backside hit by Hjalmarsson. Pominville had his back turned to Hjalmarsson and he did not have the puck yet Hjalmarsson still plowed into him. The suspension shouldv'e been longer if you ask me. Ok James, I don't like Sean Avery either but do you have any idea how many 8 year olds went home and asked their parents what that gesture meant? Class it up man. Shane is lucky he doesn't get more considering he also had a run-in with Cam Fowler in that same game. It was a clearly blindside hit, and deserves the punishment. Boynton was actually right in the original dispute but you keep it to yourself and then call someone out after the game rather than put on a display like this in front of your fans. Engelland-Orr was my #1, but here's 2 more. 1 punch TKO by MacIntyre. Check this figtht out on Youtube if you get the time. Ok, so the fight looked more like 2 helicopters taking off, but still it was a fight between 2 superstars. Great game. Avs rallied twice from a deficit to bring the game into OT when Brandon Yip won it in the 6th round of the shootout. Blues dominated them but the real fun started after the game got out of hand. Fists flying everywhere. Steven Stamkos- Already off to a great start with 5 goals and 4 assists. Marian Hossa- 7 goals already, wow, he's on record pace.